What sets Anshei Chesed Congregation apart? Why should I think about moving to Boynton? What kind of housing is available? I’m used to shopping at large kosher supermarkets in places like New York. What’s available in your area? Are there any kosher restaurants in the area? I keep hearing that the center of Jewish life in Palm Beach County is in Boca Raton. Why should I consider Boynton Beach? How can I find out what’s happening in the Boynton Beach Jewish community? I’d like to visit Boynton Beach. Is there a Hospitality Committee? What is the current housing landscape? From pre-school to high school, our children attend highly acclaimed schools. There are choices of pre-schools within a few minutes’ drive. Parents can choose from a number of yeshiva elementary schools. The Hillel Day School (www.hilleldayschool.org) is the primary yeshiva for area children and has a national reputation for excellence. The demographic switch which has seen Boynton Beach become a major “feeder community” to Hillel Day School resulted in the advent of daily bus service to and from the school right to our neighborhoods. It is accredited by the Southern Association of Colleges and Schools and is a beneficiary agency of the Jewish Federation of South Palm Beach County. The school is also an affiliate of Yeshiva University's Institute for University-School Partnership. The Torah Academy (www.torahacademybr.org) offers separate campuses for boys and girls and is affiliated with Yeshiva Chofetz Chaim. The neighboring developments in the vicinity of Anshei Chesed Congregation have housing options for everyone. Boynton Beach is a vibrant area which has experienced massive infrastructure growth and development in the past five years. The shul is located on El Clair Ranch Road between Boynton Beach Blvd. and Woolbright Road, immediately east of Jog Road. Within comfortable walking distance to the shul are numerous residential developments appealing to a wide range of tastes, preferences and budgets. The following brief descriptions are intended to give you an overview of some of the real estate options in the Anshei Chesed neighborhood in beautiful Boynton Beach, FL. Most of these homes are situated along the El Clair Ranch Road corridor. Please feel free to contact us if you have additional questions. 102 single-family estate homes with 3 – 6+ bedrooms. Many of these homes feature deluxe kosher kitchens with separate food preparation areas, granite counters, 2 sinks, 2 dishwashers, double wall ovens and natural gas cook-tops. Tremendous values still exist, as some of these homes are selling in the mid-$300K’s and beginning to edge up in price. Both neighborhoods feature community pools and paths for strolling, bike-riding, etc., throughout the community along a serene lakefront setting. 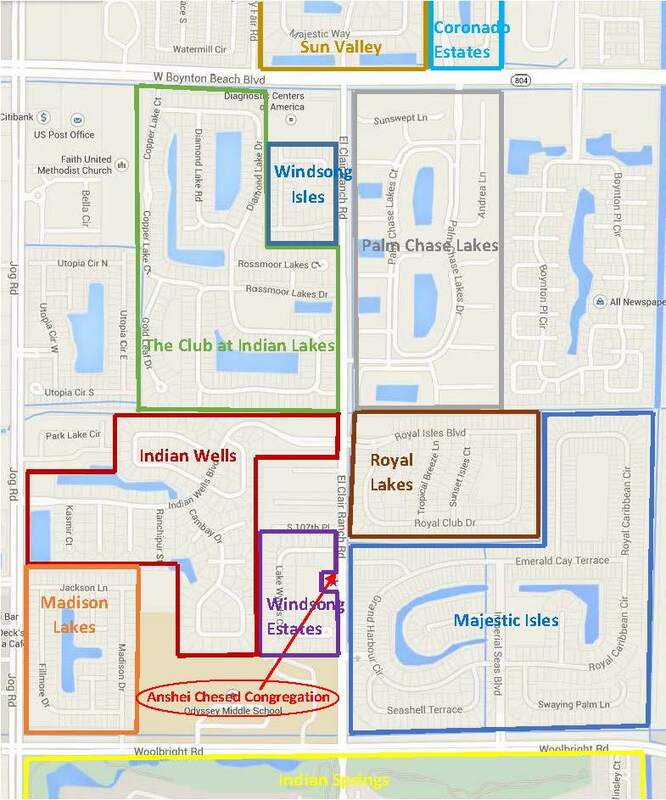 Indian Wells is located around the corner from Anshei Chesed off of El Clair Ranch Road between Woolbright Road and Boynton Beach Boulevard and is comprised of 3-5 bedroom single family homes that were built in the 1980’s through early 2000’s. There is a mix of ranch style as well as two-story homes on a variety of lot sizes. Some of these homes are absolute steals in the mid $100K’s! Other communities such as Coronado Estates, Madison Lakes and Sun Valley are a bit further from the shul, but offer a variety of housing options.